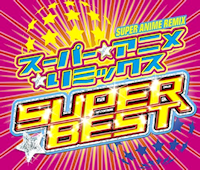 Super Anime Remix Super Best originally came out in July of 2009, but about a year later it was discontinued and any trace of it was expunged from Dreamusic’s site. The 2CD+DVD set became quite a rarity. Then in 2015, SARSB randomly popped up on iTunes with all 50 songs completely intact in non-stop mix form. The kicker, however, was that they didn’t allow for the album to be purchased as a whole, meaning you’d have to buy each of the tracks individually for 200 yen. That means 10,000 yen for the entire album. Yeah, good luck with that.